There’s never a good time to get the call. Kim Hart was in the office at 4:30 p.m. on a Friday in 2009. She was the only one left. Her husband, Jim, was out of town. She was looking forward to taking her then 16-year-old daughter, Omi, to the movies to see the “Twilight” sequel, “New Moon.” Then, the phone rang. The day before, Kim had a biopsy to check out a lump in one of her breasts. She remembered that it had “felt very large” and knew it had to be checked out. The person on the other end of the call confirmed Kim had cancer and said she needed to meet with a surgeon on Monday to discuss her options. It was overwhelming news to wrap her head around, but she knew what she needed to do next. Take her daughter to the movies. 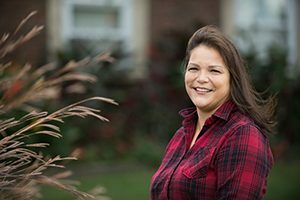 Kim is one of three women randomly chosen as Super Survivors to be honored at this year’s Memorial’s Be Aware Women’s Fair. The ninth annual event will be held from 9 a.m. to 2 p.m. Saturday, Oct. 13, in the Orr Building on the Illinois State Fairgrounds in Springfield. Today, Kim, a 47-year-old mother of two who lives in Edinburg, is moving forward with her life after that life-changing telephone call. She has an annual checkup with an oncologist every year and an MRI every other year. She has worked for the Illinois Department of Agriculture since August 2001 and became the grandstand manager for the Illinois State Fair in April 2014. She and Jim will have been married for 24 years in December. They have two children: Omi, who’s now 25, and a son, Kele, who’s 19. At the time of her diagnosis, Kim wasn’t aware of breast cancer running in her family, but she later learned two first cousins had also battled breast cancer. Her father and several of his siblings developed lung cancer; some prior and some after her diagnosis. Both her parents are deceased. After her phone call, Kim called her husband, and they agreed not to tell their children anything until the couple first met with the surgeon and had more information. Kim was particularly concerned about her son, then 11 years old, who had a classmate whose mother died from cancer. Kim was diagnosed with Stage 2B breast cancer. Her tumor measured 2.5 centimeters. A few weeks after discovering the lump, she was scheduled for chemotherapy in December 2009 to shrink the tumor. She had eight treatments of chemo from December 2009 until early April 2010. This was followed by a lumpectomy then radiation therapy – five days a week for several weeks until July 2010. In addition to her husband’s support, Kim’s mother-in-law, Barb Hart of Chatham, who had ovarian cancer about 30 years earlier, was a tremendous support. She took Kim to all of her chemo treatments. From her own experiences, she advised Kim that there would be days when the chemo would leave her feeling so drained but to remember she was strong and she would get through this. Her co-workers were also a big support, sending her cards to encourage her and helping her maintain a positive outlook at the office too. “Keeping a positive attitude and able to continue coming to work every day helped keep things feeling normal for me,” she said.